Newcomer Family Obituaries - Michael P. Hogan 1946 - 2018 - Newcomer Cremations, Funerals & Receptions. Michael Patrick Hogan was born to James and Jean Hogan on April 5, 1946 in Denver, Colorado. Michael attended Saint Francis Catholic School, Kunsmiller Jr High, and graduated from Abraham Lincoln High School in 1965. Michael served his country in the United States Coast Guard upon graduating and was stationed in Long Beach, California. Upon his honorable discharge, Michael worked at Xcel Energy, retiring in 2004 after 37 years. Michael was a dedicated and unparalleled father to two sons, Jeffrey and Benjamin and was then blessed with two daughters, Michelle and Cristi when he married the love of his life, Sherry (aka SAM), on February 3, 1978. He also was an amazing and loving grandpa, son, brother, uncle and friend to many. Throughout his life, Michael was an amazing and gifted photographer; passing on his love of taking pictures to his wife and eldest son. In addition, he had a strong passion for country and rock music, and had an encyclopedic knowledge of each. He had a huge love for the Colorado Rockies and the Denver Broncos. Michael was an avid traveler, visiting spots throughout the US and Europe, with Hawaii at the top of his list. Michael fought multiple cancers over the years, and as with everything in his life, he handled these challenges with exceptional perseverance, resiliency and courage. 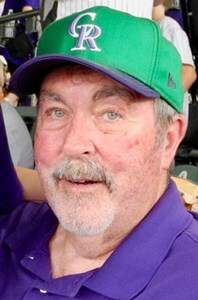 Michael passed away peacefully surrounded by his family at 9:50pm on August 6th, just seconds after hearing that his beloved Rockies had beaten Pittsburgh, 2-0. To share a memory please enter the information below. Add your memories to the guest book of Michael Hogan. We had a lot of happy times with Michael and Sherry by going up to Red Rocks for concerts and Westfest at Copper Mountain. We ate and shopped in Breckenridge until we dropped. After we all retired, there for a while, we met once a month (time permitting) to go out and enjoy a nice dinner and catch up on the latest news. We will always cherish these times. We will miss Michael very, very much. We loved him. We know that he has gone home to be with the Lord and is at peace now and no longer in any pain. Miss ya and love ya Michael and love and condolences to the Hogan family. Missing Mike's grin and dry sense of humor. I know that he and Glenn Frye are jamming together at their concert forever! My prayers and love to all the Hogans and extended family.